Your wishes for a classic Christmas centerpiece have come true! 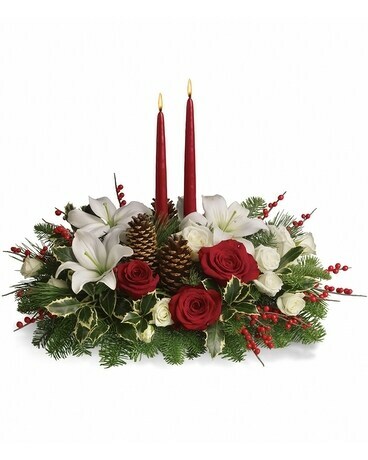 This elegant arrangement features two glowing red taper candles atop a bed of noble fir, white pine and luxurious roses. •Red and white roses are mixed with festive noble fir, white pine and variegated holly beneath two red taper candles. •Red berries and pinecones add to the Christmas fun.